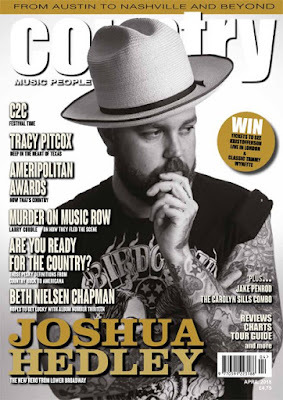 Joshua Hedley is Country Music People’s new hero and graces the April cover. 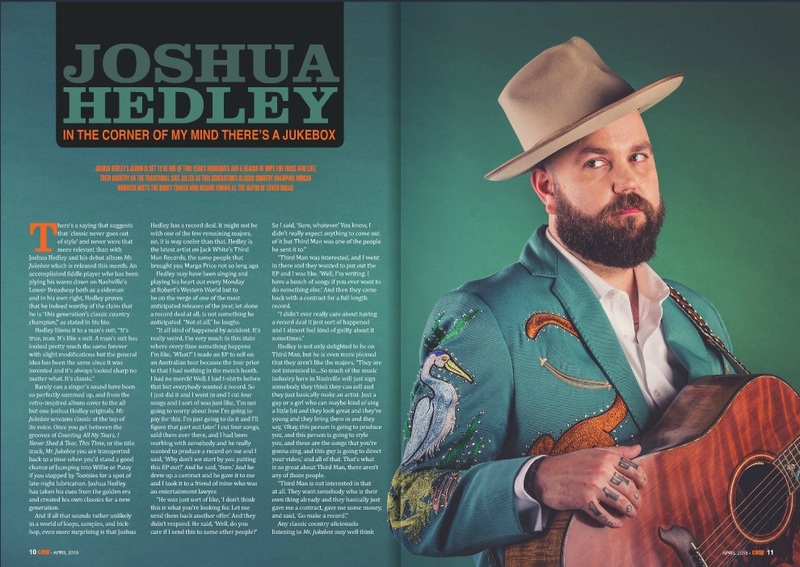 P10-13 Cover Feature Joshua Hedley This generation’s classic country champion talks to Country Music People Editor Duncan Warwick. Joshua Hedley graces the front cover of the April 2018 issue of Country Music People. (Barcode:9770591223188 ISSN:05912237). 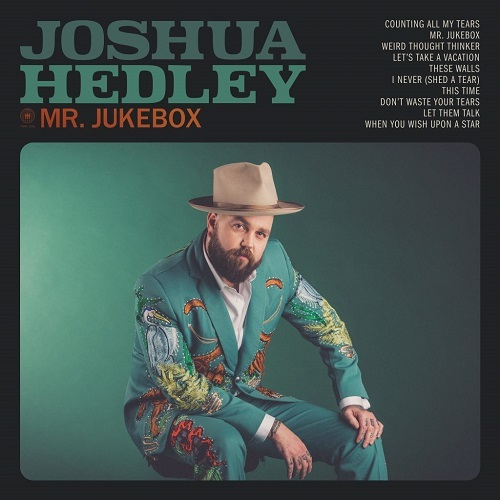 Joshua Hedley’s new song “I Never (Shed A Tear)” premiered on March 9 (listen/share HERE). The song is second track unveiled from Hedley’s highly anticipated debut album Mr. Jukebox, which will be released April 20 on Third Man Records and is now available for pre-order. In celebration of the record, Hedley will make his debut on the Grand Ole Opry on album release day—a lifelong dream for the acclaimed Nashville musician and songwriter. 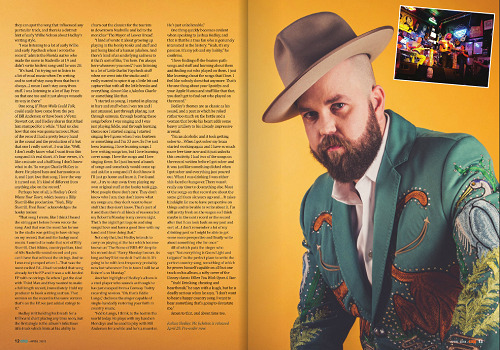 He played a series of performances at SXSW as well as festival stops at High Water Festival, Stagecoach and Pickathon and headline shows at Brooklyn’s Union Pool (April 18), Nashville’s The Basement East (April 24) and L.A.’s The Roxy (April 30) and Hi Hat (May 1). Produced by Skylar Wilson and Jordan Lehning, the 10-track album features nine original songs as well as a version of “When You Wish Upon A Star.” In addition to Hedley on vocals and fiddle, the album features Eddie Lange on steel guitar/guitar, Jeremy Fetzer from Steelism on guitar/baritone guitar, Michael Rinne on bass, Jon Radford on drums/percussion and Micah Hulscher on piano/organ. Album opener “Counting All My Tears” carves out the collection’s gloriously tear-jerking territory from the jump. 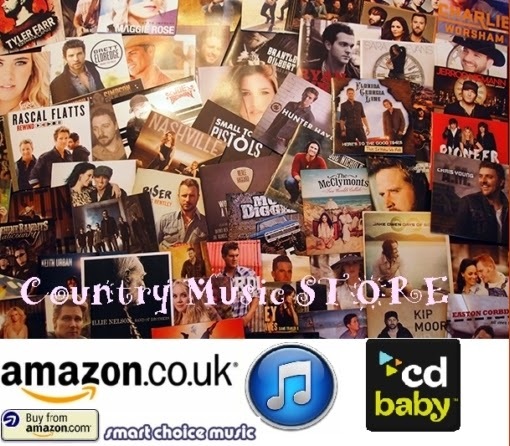 As “oooooohhhs” and “aaaaahhhs” serve as spine-tingling harmonies––a classic-country flourish carried throughout Mr. Jukebox––lonely piano is joined by a familiar cast including steel and of course, fiddle. “Mr. Jukebox” is a swinging nod to those beloved machines––both inanimate and breathing––that dependably play a lot of songs for a little money. It’s impossible to listen to the tune and not smile thinking of Hedley’s years logged in cover bands on Nashville’s Lower Broad. Lush strings kick off the sauntering “Weird Thought Thinker,” which features harmonies that evoke both bass walkdowns and angels. An ace fiddle intro opens “Let Them Talk,” a carefree ode to being in love and not worrying about who knows it. “Let’s Take a Vacation” pleads for one last lovers’ getaway to try to remember what’s been lost. Hedley delivers a masterful recitation over crying steel, soft harmonies, and rich supporting strings. He penned shuffling “These Walls” about FooBar, a beloved East Nashville dive Hedley lived near before it shut down. Copyright: ℗© 2018 Third Man Records LLC. A Florida native, Hedley felt inexplicably drawn toward the fiddle as a child. He first asked for one at age 3. His mom listened to Neil Diamond and his dad listened to Otis Redding––they didn’t see the request coming––but when he asked again five years later, they were struck by the longing’s staying power and, at 8 years-old, he finally got his hands on his very own instrument. He went on to perform at the local VFW and American Legion and, at 12, joined his first band. His bandmates were in their 40s. Around the same time, Hedley visited Nashville with his parents and immediately knew that he belonged. At 19, he made the move and began sneaking into Robert’s Western World––too young to drink legally and too wild to care. Hedley went on to become a featured performer and in-demand sideman at the now legendary spot and, ultimately, a well-respected frontman. Armed with an easy croon and prodigious fiddle playing, he became known by peers as the Mayor of Lower Broad. In the years since, he’s performed with artists including Jonny Fritz, Justin Townes Earle and more and was featured prominently in the the 2015 documentary, Heartworn Highways Revisited.